Please browse our FAQ section below. If for some reason you don't find an answer for your question feel free to contact us on our contact page! • How does my septic tank work? 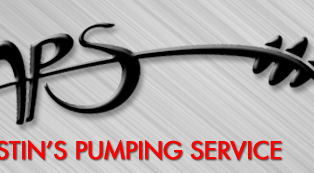 • Why should I have my septic tank cleaned regularly? • How often should my septic tank be cleaned? • What can I do to keep my system running well? • What causes the thick crust (scum) in my tank? • What does your cleaning service include? • I had my septic tank pumped out about a week ago and it is full already. Why? • How can you tell if my septic tank is working? • What environmental issues are most important regarding septic systems? • Are there other important environmental concerns? • I have an alarm light/horn warning going off - what does that mean and what should I do? • Can I plant trees, shrubs, or kill the grass on my septic tank / drainfield? • Can I drive or park on my septic tank or drainfield? 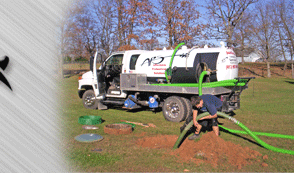 • Need I be present when my septic tank is pumped? • Does a softener connected to the system hurt it in any way? Q. How does my septic system work? A. Your septic system is your personal wasterwater treatment plant. It is designed to receive and process household waste from laundry, sinks, toilets, etc. Once in your tank, bacteria feeds on the waste converting much of it to liquid. Non-digestable inert matter settles to the bottom (sludge), and the grease rises to the top (scum). The liquid passes through the baffles (pipes) to the drainfield where it is absorbed into the soil and cleansed. Q. Why should I have my septic tank cleaned regularly? A. Ongoing cleaning and inspections of your septic system will keep your system operating at its optimal performance and greatly extend its useful life. This maintenance will prevent problems such as slow draining sinks and toilets, and septic back up into your home. Regular maintenance will also defer the costly replacement of your drainfield. By cleaning your septic tank every two to three years, the level of sludge is kept low. If allowed to build up, the sludge can enter the drainfield, plug the pipes and drainbed soil, and prevent liquid from being absorbed. Consider cleaning and inspections a necessary investment in your home’s continuing functioning. It affords you peace of mind, protection from embarrassing sewage backups, avoidance of a costly drainfield replacement, avoidance of significant disruption to your landscaping / property’s appearance. Q. How often should my septic tank be cleaned? A. The answer to this question depends directly on how the household uses the system. Variables such as how many people reside in the home, garbage disposal use, age of the system, how much entertaining is done, etc. affect the time period in which solid waste accumulates in the septic tank. On the average, the septic tank should be cleaned out every two to three years. This frequency is based on a typical family of four. After cleaning and inspecting your system we will be able to give you a frequency recommendation. Heavy use of a garbage disposal increases sludge build-up and consequently the cleaning frequency. Q. What can I do to keep my system running well? A. One of the best things you can do is to make sure the sludge is pumped out of your tank every two or three years. Harsh chemicals like paint solvents, thinners, and nail polish removers should never be poured down the drain. Bleach, sink and toilet cleaners, and drain openers are also harmful to the organisms in your tank that help to break down bacteria. Diapers, feminine products, cigarette butts, condoms, and q-tips can cause blockages and should not be allowed into your system. Q. What causes the thick crust (scum) in my tank? A. The crust is the organic material that has congealed into a solid mass. This condition can indicate a bacterical deficiency. Treating your tank with Austin's Bio-Treatment accelerates the population of aerobic bacteria and enzymes that helps attack and convert this scum to liquid. Q. What does your cleaning service include? • Use of long hoses to protect your lawn and landscaping. • Locate, neatly remove sod, dig down to septic access lid, piling all sod and soil on a tarp. In closing we tamp the sod in place, so ideally, it is difficult to see the disrupted area. • Total removal of all water, scum and sludge from each tank. • Brochures detailing care suggestions on how to maintain your system's performance and longevity are left for your review. • Adding your name to our database we will mail you a reminder card based on your tech's recommended cleaning frequency, usually every three years. Q. I had my septic tank pumped out about a week ago and it is full already. Why? A. As wastewater is discharged from the house, the tank will fill back up in a short period of time and then begin to trickle-flow into the next tank or to the drainfield. The rate at which the tank fills up of course depends on the gallons per day that are discharged to the tank. When onsite sewage systems are sized one of the factors that is included in the calculation is projected gallons per day of water used. The standard applied is 150 gallons per day per bedroom, or 75 gallons per day per person. This daily use takes into consideration water use for entertaining, food preparation, personal hygiene, laundry, dishwashing, etc. A. Unfortunately, in this case no news is good news. Typically, when you see signs it isn’t working it is too late, ie your drainfield has failed. The only way to ensure continued performance is regular cleaning and inspections. Q. What environmental issues are most important regarding septic systems? A. As population increases in any area, the concern of where, how much, and of what quality septic effluent of these homes has on the environment increases. The simple fact is that all of the septic waste water winds up in the environment. If we are lucky, it is safe and stays where we want it. As it either evaporates or seeps into the earth, we expect it to do no harm to the land, waters of the land and the people who live near. Q. Are there other important environmental concerns? A. Yes. Drinking water and the protection of the watershed that supplies our drinking water is constantly being compromised. Some of these factors are the population growth and the demands put on the natural resource, the pollutants that get into the water supply from this growth, periodic industrial spill accidents that further damage or make the water supply unfit for human use, and the increase in the number of failed or stressed septic systems. Q. I have an alarm light/horn warning going off--what does that mean and what should I do? A. The alarm warning means that something is amiss in the pump chamber that lifts effluent from your pump vault to your drainfield. The first thing you should do is restrict the use of water until you determine what is wrong. It may be something as simple as a tripped breaker to the pump or it could be a failed pump. The alarm is triggered when the pump isn’t working and the water rises to a predetermined level when the alarm is activated. Q. Can I plant trees, shrubs, or kill the grass on my septic tank / drainfield? A. No. Plants and shrubs grow roots and they love the rich nutrients in septic tanks, and drainfields. Anything that binds or interrupts the flow of effluent through to your drainfield reduces your system’s efficiency, performance and longevity. Killing the grass is also not recommended. The grass is very useful in the absorption process and also brings oxygen into the soil. Q. Can I drive or park on my septic tank or drainfield? A. No. Your septic tank could collapse under the weight. Drain lines are not usually that deep so anything heavy driving over them can cause them to be crushed or damaged. Also, if you compact the drainfield soil it interrupts the necessary oxygen exchange, also reducing performance and longevity. Q. Need I be present when my septic tank is pumped? A. That is entirely up to you. There is no need. We can locate the tanks, uncover the lid, clean, inspect, fill in the hole above the lid, lay the sod, and leave with minimal disruption. Some people are curious. Some want to ensure they get a quality job. We welcome the company. Q. Does a softener connected to the system hurt it in any way? A. Yes. A softener discharge is brine and can harm the good bacteria you have working in your system. The softener also dumps large volumes of water at one time which tends to flood the system. Also, the salt can corrode and deteriorate the concrete, of which most tanks are constructed.